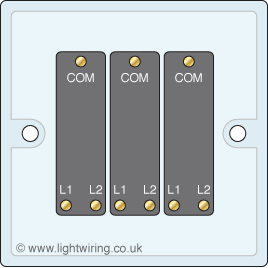 Each of the gangs (or switches) above in Fig 2 (of which there are three) work like this (Fig 3): In position 1 (when the switch is down or ‘on’), COM and L1 are connected together (just like the one way switch). 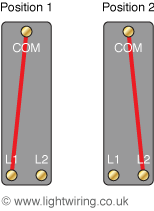 In position 2 (when the switch is up or ‘off’), COM and L2 are connected together. There are no connections between the three gangs in Fig 2. 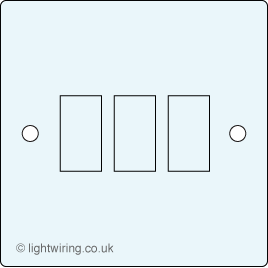 Each gang is a single discreet switch.